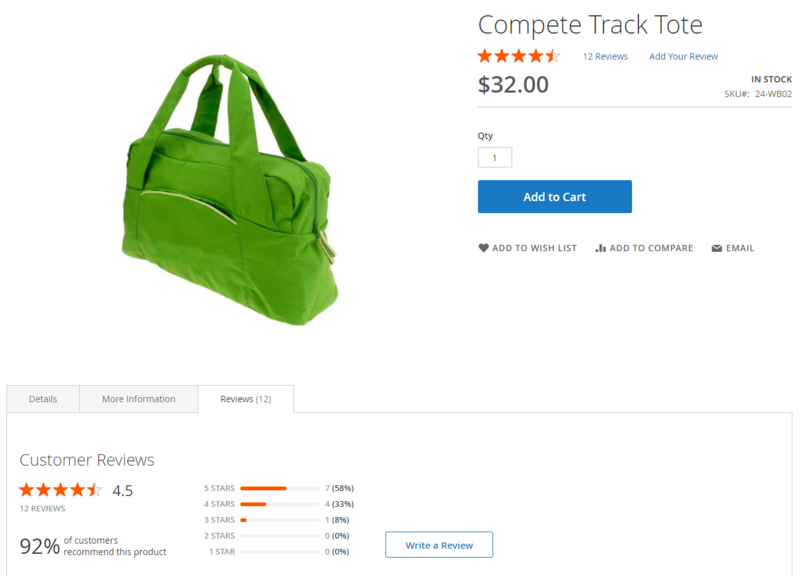 Product reviews are one of the best sources for user-generated content on web stores. Besides, reviews are an excellent motivating factor for online shoppers, helping them to decide on what to buy on your store. As for collecting reviews, it is vital to provide website visitors with the most convenient options for writing reviews, since spending time on looking for the reviews section and submission form, logging in, and other actions can distract them from leaving their opinion. Advanced Reviews for Magento 2 by Aheadworks is the solution that brings store owners tools for making the review submission process user-friendly and time-saving for both customers and admins. The module allows writing reviews right from the requests received by email along with the on-site submission form. 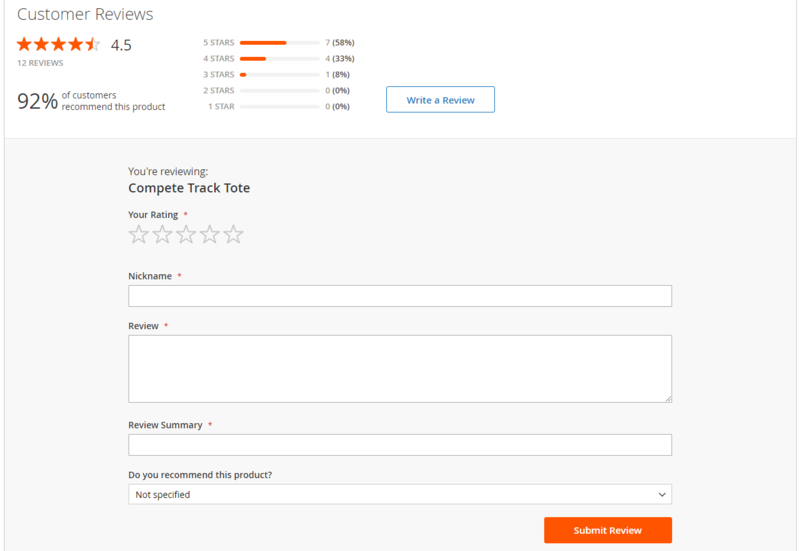 As a result, you can collect a larger amount of product reviews and display them to create a live and dynamic atmosphere on your ecommerce site. 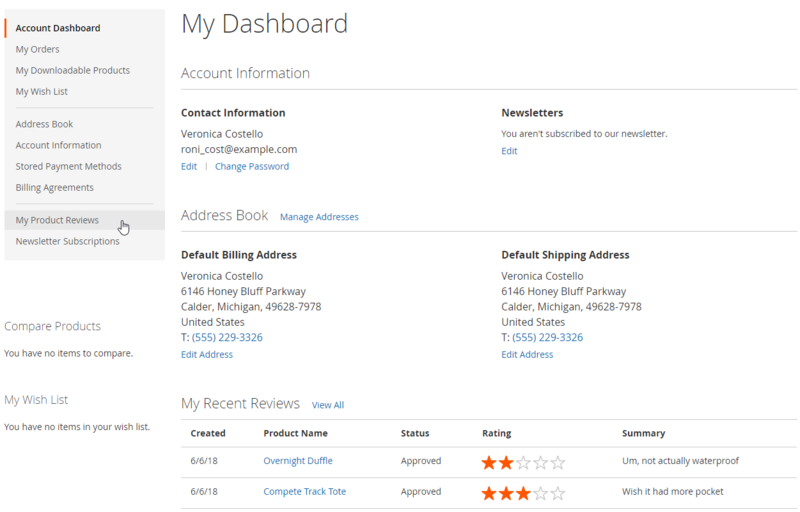 After you install the extension, customers will be able to quickly write product reviews, give ratings, and recommend products using the in-store review form. Collecting of product reviews is facilitated by the opportunity to submit a review right from the email. The module allows sending email request reminders, which makes review submission process more comfortable and faster and generates more feedback from customers. Email submission form has the same fields as the on-site one, so users can submit the same information about your products with no need to visit your website. Review requests are sent automatically in any period after the purchase specified by the admin. Besides, you can use Advanced Reviews email form integrated with a Follow Up Email extension to leverage all benefits of targeted emails. Customers who submitted their reviews via email can automatically receive the “Verified Buyer” badge (after approval by admin). The badge acts as a social proof for products on your store. Magento admins can mark review authors as verified manually as well. Availability of comments left by merchants to customer reviews acts as evidence of live atmosphere and communication on an online shop. Besides, it is essential to handle negative feedback properly and show concern to every reaction. Using the Advanced Reviews module’s functionality, store owners can display their professionalism and customer care, leaving comments to every review. In this way, you can express your thanks to positive reactions, try to help users solve some issues, or give more detailed information on your goods promoting them to shoppers. Spending time and energy on browsing through the whole bunch of reviews to get an extended overview of a product might become a reason for giving up the planned purchase. For this reason, the Aheadworks extension provides the ability to add review summary blocks providing your website visitors with the first impression on the item they are interested in without the need to read every review. This feature helps online shoppers make faster decisions on what they want to buy, while store owners increase their sales by improving customer experience. 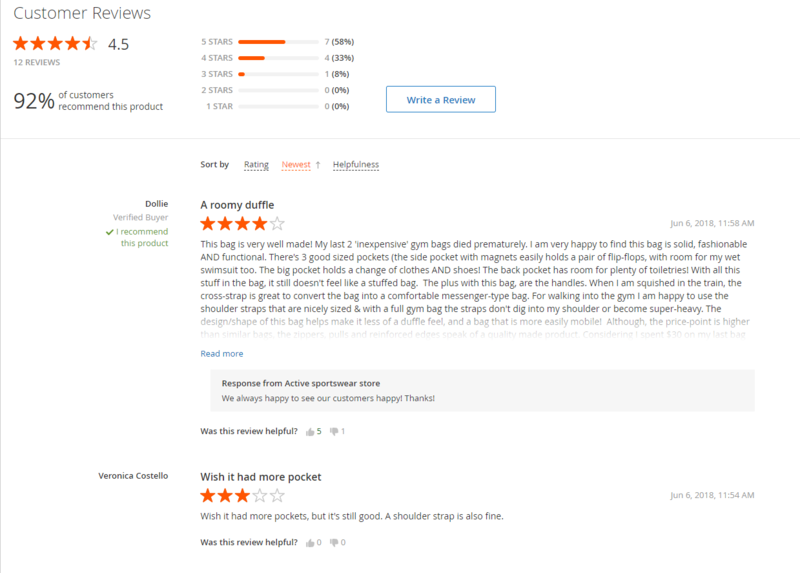 Also, review list on the product pages helps visitors make their opinion on a product even easier since they can see all reviews with related comments, helpfulness score, and customer recommendations at a glance. 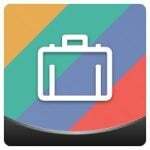 Along with review summaries, you can display helpfulness voting under every review, so that visitors will navigate smoothly through the information related to particular goods. In this way, customers help each other, while visitors don’t have to spend time on reading the reviews they are not interested in. Configuration settings of the Advanced Reviews Magento 2 module enable admins to track and manage all essential details on each review from a single grid, set email reminders, modify submitted data, and more. In addition to the features described above, the module brings users some more functions for additional benefits, including compliance with GDPR requirements, SEO friendly pages with improved schema.org markup, Web API support, as well as both frontend and backend built on UI components which speeds up uploading of product pages even with a significant number of reviews like 500+. Furthermore, the Advanced Reviews extension allows importing existing reviews created before the module was installed via the command line. Note that more features will be added soon, including images support, “all reviews” page, automation of review approval, sharing on social media, and more. Now, let’s have a look at the backend configuration of Advanced Reviews for Magento 2 by Aheadworks. Action – options to select: Edit; Go to Product; Go to Customer. You can also apply mass actions, such as delete, change status, set “Verified Buyer” badge, or update recommendation, to the selected reviews. Besides, it is possible to filter and sort the grid columns and save the grid view. The module enables admins to edit existing reviews and add new ones from the backend. To create a new review, click the “New Review” button; to edit a review, select the required record in the grid. The Edit Review page displays the name of a related product, author of the review, and the date of creation. Note that the assigned product and date can’t be changed after a review was created. Next, you can modify the review’s rating and status, author’s nickname, review summary, and content of the review itself. Then, you can change the “Do you recommend this product?” option (Yes, No, or Not Specified) and assign the Verified Buyer badge to the review’s author manually by moving the toggle. You should also decide on the store view depending on where you want to display the review, add a comment if necessary, and adjust the number of positive and negative votes. Now, let’s see how main settings of the Aheadworks Advanced Reviews extension can be configured in the Magento admin under Stores → Configuration → Aheadworks Extensions → Advanced Reviews. The module’s configuration is quite straightforward and consists of only two sections: General and Email Notification Settings. In the General tab, you specify Admin Comment Caption which defines a title of the caption used for the comments you leave to customer reviews. As for Email Notification Settings, here you select an email sender, enable/disable review reminder notifications, specify the period for sending out notification emails, choose templates for email reminders and admin notifications, as well as determine an email address for receiving admin notifications. Now, let’s see how the reviews added to the product pages by the Advanced Reviews extension can change the look and feel of your website. 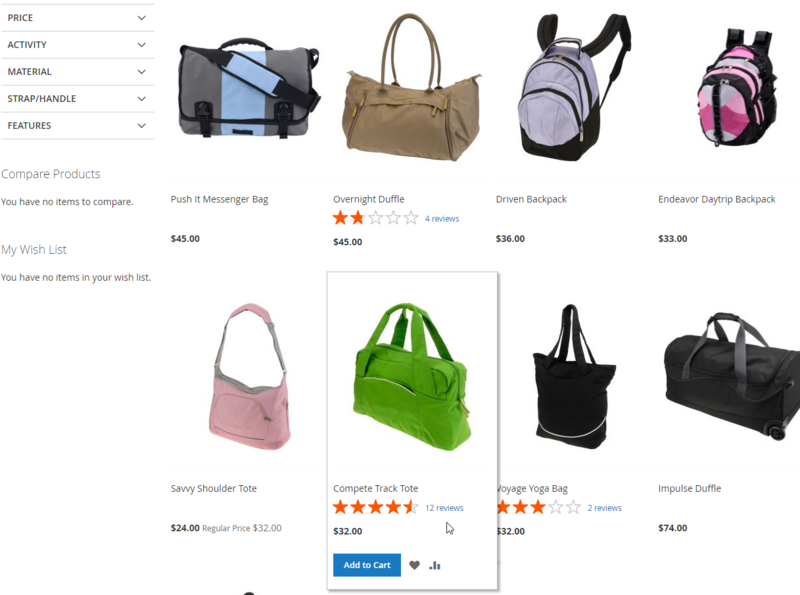 First, pay attention to the category and catalog pages – products are displayed with the star ratings and the number of reviews. If a user clicks on the link with review number under the product, it will open the related reviews. The module adds a separate tab with all reviews to the product pages. Under the tab, there is a Customer Reviews section which displays the overall product rating, total number of reviews, the percent of customers recommending the product, and the percentage of ratings split by the number of stars given by reviewers. From here, your store visitors can submit their reviews by clicking the “Write a Review” button. Below the Customer Reviews section, there is the list with all reviews related to the product. The authors of the most reliable reviews are marked as a Verified Buyer. For each review in the list, star rating, product recommendation, date and time of submission, admin comments, and helpfulness assessment are displayed. The possibility to sort the reviews by Rating, Newest, or Helpfulness allows users to navigate conveniently within the reviews list. One more “Write a Review” button is located at the end of the reviews list, allowing customers to submit their reviews quickly without scrolling the whole page again. 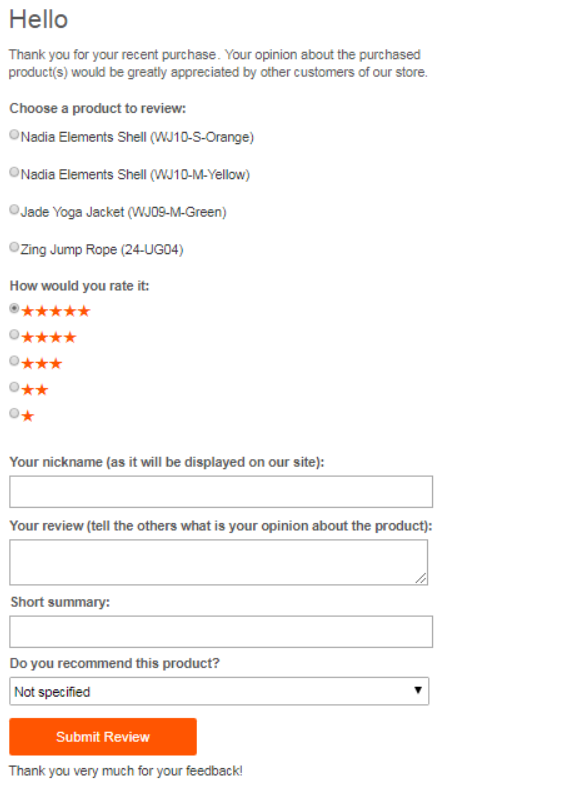 The in-store review submission form has an improved user interface comparing to the native Magento form. There are four compulsory fields in the form: Your Rating, Nickname, Review, and Review Summary. One more field in the form relates to the product recommendation. Note that the extension offers customers to write a text of the review itself first and then specify its summary, which makes it easier for users to summarize their review. As we’ve already mentioned, another option is to request a review via email without the need to visit a store. The email review form has the same functionality as the on-site form. The reviews submitted by email can automatically receive the Verified Buyer badge. Note that it is possible to send a review once on every product in a customer’s order. Furthermore, the Aheadworks extension adds My Product Reviews section to customer accounts. 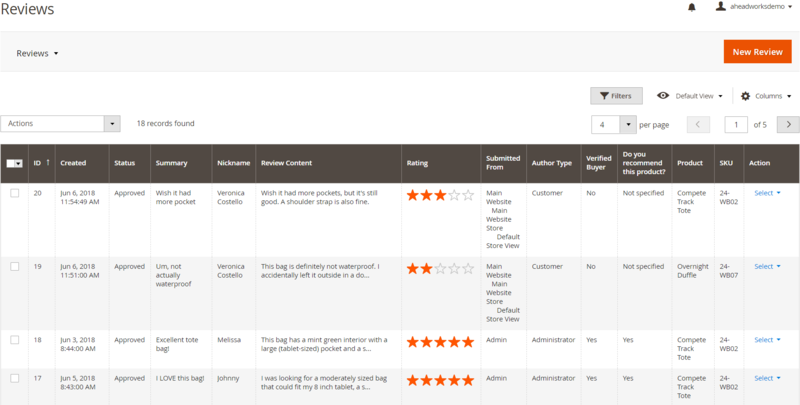 Customers can track statuses and check other details of the reviews they’ve submitted from the corresponding grid. The Aheadworks Advanced Reviews Magento 2 module is an excellent solution for ecommerce sites to collect more product reviews in a shorter period and build brand credibility among potential and current clients. 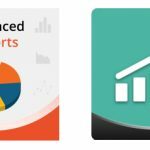 You can leverage the extension to promote particular products, build closer communication with customers, and understand their opinion on the products and services you sell. You can purchase the module for $299 with free installation service, lifetime updates, and 90-day support included.